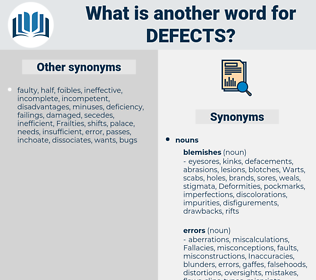 What is another word for defects? Deformities, failures, glitches, drawbacks, bugs, cracks. departures, fault, Disparities, anomaly, Anomalies, exception, default. 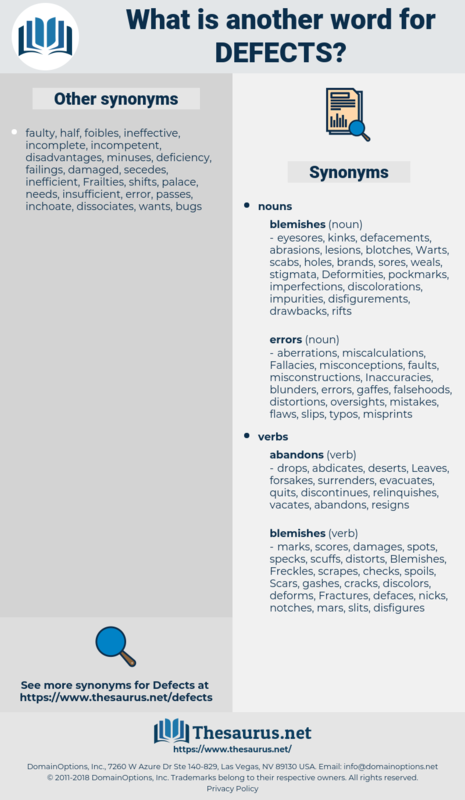 conditions, deficits, misunderstandings, insufficiencies, detects, Inconsistencies, Artefacts, inconsistences, characteristics, deviations, Miscarriages, Defaulting, inefficiencies, contraventions, dysfunctions, deprivations, defaults, Incidences, dislocations, incidents, disorders, modifications, imbalances, discrepancies, Difficulties, vulnerabilities, infringements, disturbances, malfunctions, mistakes, impairments, corrections, interruptions, derogations, Improprieties, effects, matters, breakdowns, malpractices, setbacks, bottlenecks, aberrations, alterations, obstacles, constraints, subjects, dispensations, liabilities, verdicts, inadequacies, disruptions, Inaccuracies, distortions, troubles, ailments, demerits, drifts, divergences, shortages, DTCS, recordings, wrongdoings, decisions, injustices, Records, shortfalls, infractions, breaches, respects, misdemeanours, violations, Uncertainties, blunders, limitations, non-compliances, loopholes, faults, commotions, exceptions, offences, findings, efficiencies, pronouncements, occurrences, demons, changes, discovers, Discoveries, challenges, damages, illnesses, Disabilities, requirements, omissions, variations, implications, services, tickets, misdeeds, mutilates, handicaps, inequities, niches, caveats, downsides, voids, questions, lapses, grievances, features, lesions, leaks, impurities, issues, losses, problems, Vacancies, convictions, Maladies, scarcities, scares, foibles, repairs, Blemishes, wrongs, things, concerns, underages, breaks, sentences, carcases, flats, Injuries, vices, hitches, stops, premises, offenses, pitfalls, IMPACTS, buildings, exemptions, Vacuums, cons, odds, ills, outrages, Biases, upheavals, blocks, tasks, situations, abuses, Judgments, judgements, holding, Wounds, workouts, drops, gaps, slips, snags, tares, grounds, authority, sins, awards, palaces, evils, crashes, limits, mansions, shocks, Queries, lagoons, warps, Carcasses, Visions, Habits, senses, departures, rulings, pros, flows, kinds, Anomalies, holes. malformations, failings, errors, Abnormalities, Irregularities. It appears, therefore, to them a necessary preliminary to this second undertaking, to consider the causes which, in their opinion, have produced the failure of the first, - that the defects of the original plan may be supplied, its errors corrected, and such useful regulations as were then adopted may be further explained, enlarged, and enforced. Recognized defects in your county government. dibasic acid, divest, deep-seated, divagate, depict, deposit, de facto, deficit, deep south, diapsida, depicted, diapsid, deep pocket, dopastat, diffused, deep-set, debauched, devastate, debased, defaced, dovecote, dope sheet, data-based, deep-chested.